Here in Guernsey we love our food, and with such a wide selection of local produce on offer and over 88 restaurants in a variety of cuisines to choose from, it’s easy to know why! Whether it’s chips on the beach watching the sunset, dining out in one of Guernsey’s many restaurants, having a Guernsey Cream tea or a freshly baked pastry from Senner’s Bakery, Guernsey offers plenty of opportunities when it comes to eating out. You don’t have to eat out to make the most of Guernsey’s food. 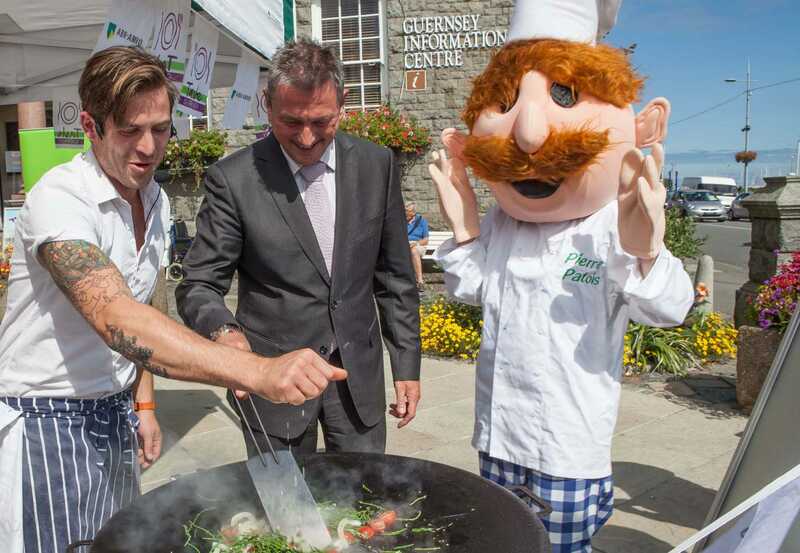 Why not cook some fresh Guernsey produce yourself? There are plenty of opportunities to do this, such as purchasing some freshly caught fish from a local fishmonger, or stopping of at one of Guernsey’s many ‘hedge veg’ stalls where locals sell their home-grown fruit and veg on the roadside. Every October the Channel Islands plays host to the Tennerfest food festival, where many eateries put together special set menus at set prices, starting from as little as £10 for three courses. Click here to find out more about the Tennerfest. And it doesn’t just stop at food, Guernsey also has its own brewery and cider farm producing a selection of beers and the popular Rocquette cider. To experience fresh Guernsey produce, come along to the Fresh Fridays in Market Square, St Peter Port – more information can be found here. If you’d like to find out more about eating and drinking in Guernsey, visit the VisitGuernsey page by clicking here. Fancy trying your hand at making a traditional Guernsey dish such as Gâche Mélée, Guernsey Gâche, Bean Jar or even Potato Peel Pie (made famous from the International best selling book, Guernsey Literary and Potato Peel Pie Society)? Experience Guernsey’s heritage through a variety of events throughout the year. From the Viaer Marche, an evening of old Guernsey tradition, food and entertainment, to Liberation day, when Guernsey’s town comes alive for a day of fun and celebrations. Markets are one of the best ways to experience Guernsey fresh produce, from home grown vegetables, to freshly made Guernsey Gâche and homemade jam. Just make sure you get there early to get the best pick! It doesn’t stop there: With food and floral festivals, a town carnival, outdoor concerts and performances, there’s always plenty to do. It’s not just Guernsey that offers all the events and fun: Why not take a trip over to Sark and experience the famous Sark Folk Festival – a sell-out music event held over two days showcasing both visiting and Channel Islands artists. To find out more about events in Guernsey visit the VisitGuernsey events page. 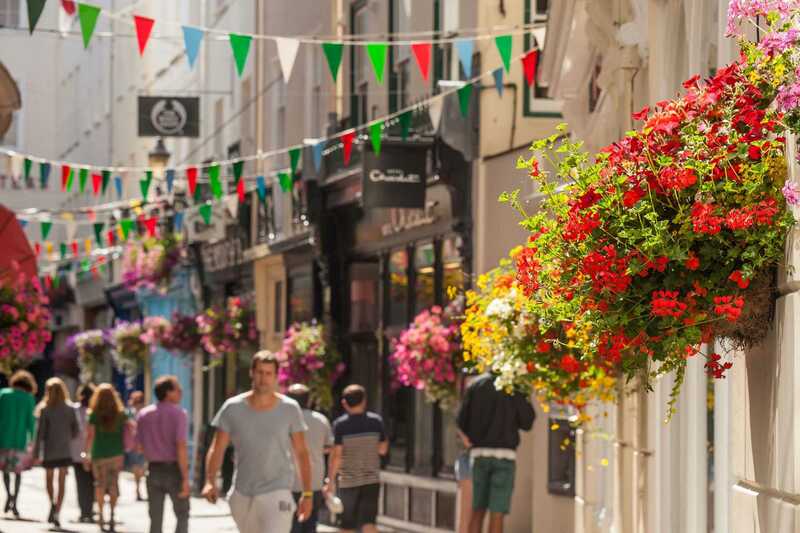 St Peter Port (Guernsey’s Town) offers a mix of boutique shops and larger branded shops such as WHSmith and New Look, as well as small shops offering locally made products and antiques. Town is always alive with regular markets and events, giving local suppliers the opportunity to sell their produce. To find out more about shopping in St Peter Port click here. There are also other retail areas in Guernsey such as “the Bridge” in St Sampson’s or St Martin’s village. With numerous local grocery stores you are never more than 10 minutes from a shop. But if you’re looking to do your weekly food shop there are also a number of larger food retailers around the Island, including Waitrose, Marks and Spencer and the Cooperative.